Following, from Karl Peterjohn, an account of why the Wichita Pachyderm Club is a valuable civic institution. The candidate mentioned in the article is Renee Duxler, running for Sedgwick County Commission District 1 (map is here). On her Facebook page she wrote “Proving once again that Democrats and Republicans can share ideas and thoughtful discussion within the same spaces … this gal ‘infiltrated’ the Wichita Pachyderm Club for a great presentation by Kyle Bauer, of KFRM radio, on the history and future of agriculture here in Kansas. They were very gracious and welcoming, and I enjoyed the experience immensely. Let’s keep the conversations going Sedgwick County!” Of note: Her opponent, Wichita City Council Member Pete Meitzner (district 2, east Wichita), said he was “troubled” that the Pachyderm Club had a member who supported Duxler instead of him. I want to protect the identity of the Democrat candidate who made the decision to attend the October 12 Pachyderm Club meeting in downtown Wichita. I am concerned that retribution from the leftist loons and Alinskyite thugs that inhabit the extremist, but increasingly mainstream wing of the Democrat Party could be substantial. This is not a partisan statement. A couple of days ago I saw an online report where a Pennsylvania Democrat was forced to resign his party position because of his pro-American beliefs. While I was presiding as the substitute president, I had the task of introducing elected officials and during elections, candidates running for office. This is routine with anywhere from a half dozen to a dozen candidates in attendance as we were about four weeks away from an election. I was informed that a Democrat candidate was attending this GOP meeting and I was asked to include her in the candidate introductions. In our current age where GOP members of Congress have been shot and assaulted by socialist and leftists (Steve Scalise and Rand Paul), where GOP offices from Manhattan to Wyoming have been vandalized this month, where GOP candidates in Minnesota have been physically attacked while campaigning, it would have been easy to decline this request. I considered doing this. However, there should be civility in our public affairs, despite odious comments to the contrary from presidential candidate Hillary Clinton, about civility being only for progressives, liberals, and leftists. Dare I say it, we increasingly live in a country and period of time where good political manners, are the exception and not the rule. Now the Pachyderm rules are clear, with all GOP candidates being endorsed for the general election ballot, but no position taken in contested primaries. The rule on public introductions is not clear, was left to the presiding officer, no matter how temporary he happens to be, at the podium. When I got down to the Democrat candidate’s name I went ahead and introduced her to the Pachyderm Club members and guests. I did point out her party affiliation, and contrasted the Pachyderm’s polite treatment of this Democrat candidate with the vile statement from the Obama administration attorney general Eric Holder that violence, in the form of his admonition, “… kick them,” in attacking Republicans is increasingly the political standard today. The Wichita Pachyderm Club has occasionally had democrats as speakers. I pointed this out. A prominent Wichita Democrat, Professor Mel Kahn, has spoken to Pachyderm and the informational speakers, whether they are talking about Plato, Alexander Hamilton, or at this meeting, agriculture in Kansas, do not have a partisan political subject. This speaker, KFRM radio’s Kyle Bauer, could have just as easily provided his excellent agriculture presentation to Democrats, Libertarians, or any other group of Kansans interested in this important part of our state’s economy (This is a free plug for Mr. Bauer who provided an exceptional agriculture presentation). I believe that the Pachyderm Club provided an example of civility in the public policy arena. This is Kansas nice. Sadly, this is increasingly the exception in today’s toxic political climate where conservatives and Republican elected officials are harassed in public, harangued at restaurants, in office hallways, town hall meetings disrupted, and general nastiness under Representative Maxine Waters admonitions promoting thuggery are increasingly commonplace. 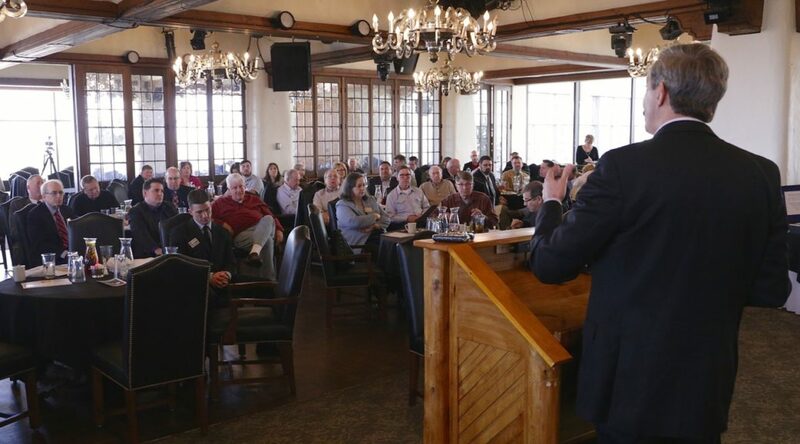 I must admit, that in the past the Pachyderm Club has taken steps to make sure that disruptions, and disruptive behavior, did not occur from non-members who opposed a speaker at one of our meetings. How sad. The Constitution of our country is the outline of how we govern ourselves. The states, and the localities and governmental bodies created by the states (like counties, cities, and school districts), are the public institutions we use to resolve public policy differences in our democratic republic. Our Constitution has been a model for the rest of the world since it was enacted in 1789. Other nations resolve their public policy differences by other ways, using other means. These often conflict with the liberty our Constitution and its amendments, tries to establish. It has been said, that politics is a form of war by other means. We had one civil war, with over 600,000 killed and hundreds of thousands permanently injured, and that is a part of our nation’s history when our differences could not be resolved politically. Violence and thuggery should not be part of our future, but it is a present problem, and a growing threat to our republic. I am glad that civility was alive and well at the Pachyderm Club on October 12. I hope that this becomes a model for other public meetings by other groups in the future. I am afraid that this political civility was an exception, but it does deserve public notice since the local news media was not in attendance. Ms. Duxler’s Facebook post on Monday morning sound exactly like you two. We’ve all had a good laugh! It’s not surprising to see such horrid use of the English language from Meitzner supporters. Here’s your “s.” Civility? I can’t imagine being so concerned with such non-sense. Good night, Mr Weeks.